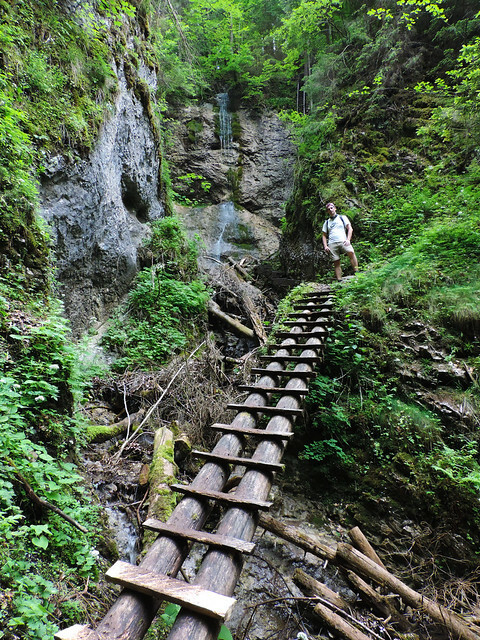 Slovak Paradise National Park (Národný park Slovenský raj) is a real paradise for outdoor and adventure lovers. It has several narrow glens and valleys, charming clear creeks and waterfalls which offer shorter and longer hikes both easy and more challenging ones. Ladders, platforms and iron steps built-in the rock make it possible to explore these wonderful glens without professional climbing equipment and skills. Most of the glens are short, but it’s easy to plan a full day hike while exploring more of them as a loop hike. 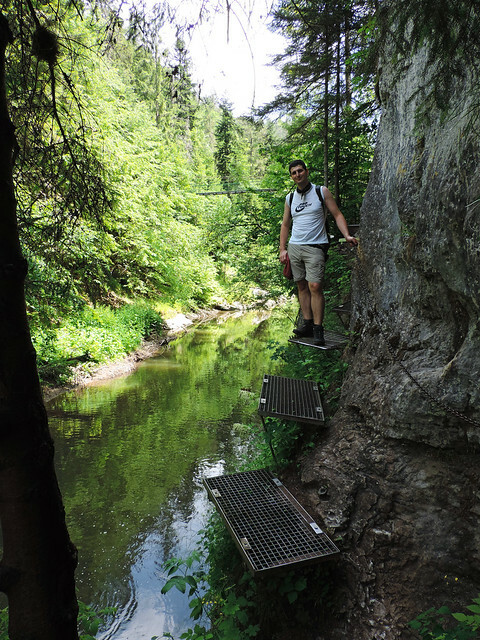 That’s what we did when we explored Falcon Valley, one of the wildest ravines in the park. 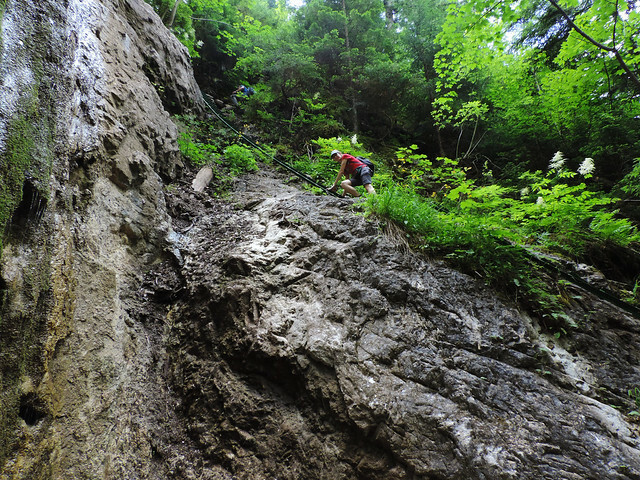 Falcon Valley is also one of the most remote ravines, so you need to plan it as part of a longer loop anyway. 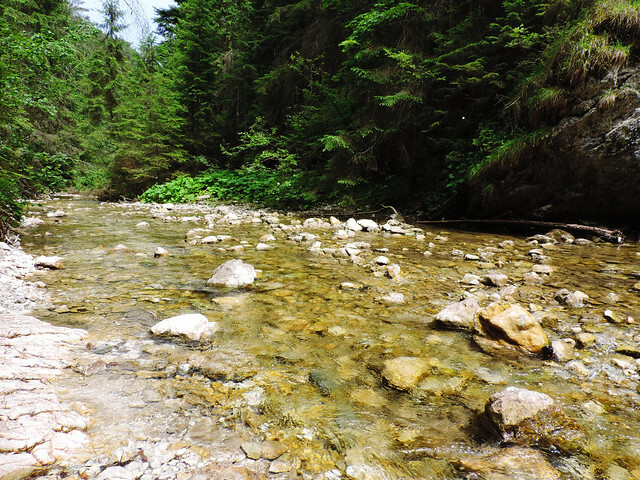 We didn’t went all the way to the end of Hornad River Canyon though, after crossing the bridge we were looking for the fork towards Kláštorisko. 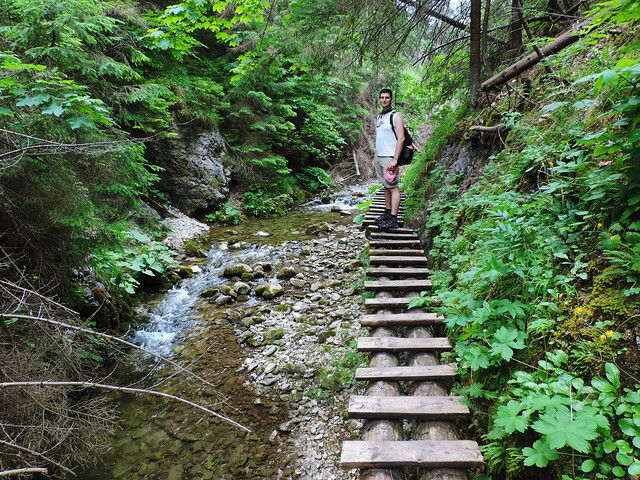 It’s the green route and it led us through Kláštorská glen which is a short and lovely glen with some small waterfalls and some ladders to climb. After leaving Kláštorská glen we reached Kláštorisko. Meadows were colorful with hundreds of blooming wildflowers and you can also find a restaurant and a mountain hut at Kláštorisko (and toilets, too). It’s a big fork and you have various options to continue your hike from here. We headed down to Kyseľ on the yellow route because eventually this gives access to Falcon Valley. 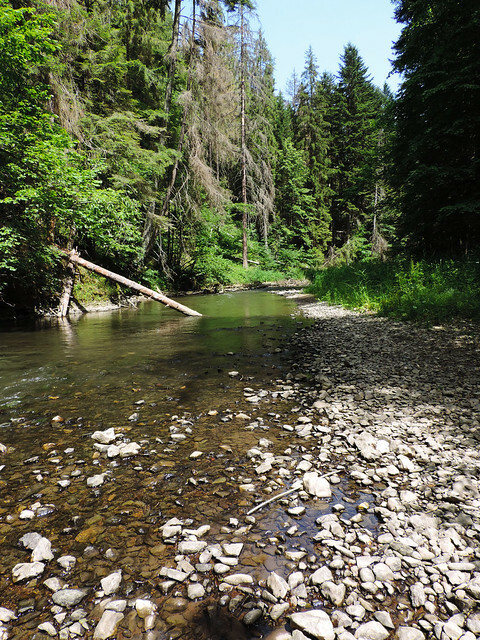 We hiked from Kyseľ to the Falcon Valley entry point on the green route along a lovely clear stream. Watch for the fork to Falcon Valley though, it’s not far. The yellow route led us through Falcon Valley (Sokolia dolina) which is the most challenging of all the glens we’ve seen in the Slovak Paradise. Particularly because of the climb over the 75 meters high Závojový Waterfall. Series of ladders, footbridges, metal footsteps and chains helped us doing this breathtaking climb safely and we had quite some dramatic views of the waterfall and the cliffs. As long as you watch your steps and not afraid of heights it’s a fun challenge! There’s 3 other smaller waterfalls, too, in Falcon Valley. 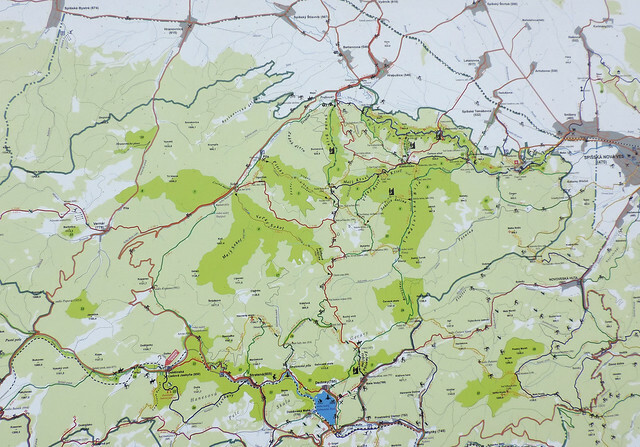 Finally, the green (to Biskupské chyžky) – yellow (to Glac-Malá poľana) – blue (to Suchá Belá exit) – yellow (to Pod Vtáčím hrbom) – red (to Podlesok) combination led us back to Podlesok from the top of Falcon Valley. It’s a combination of easy trails outside of glens which are there to complete your loop. Most of the glens are one-way (only up!) and there’s always trails established outside of glens and canyons to create a loop and lead you back to the trailhead. If Falcon Valley seems too challenging for you or you don’t have 7-7.5 hours to do the full loop, there’s a chance to shorten it. 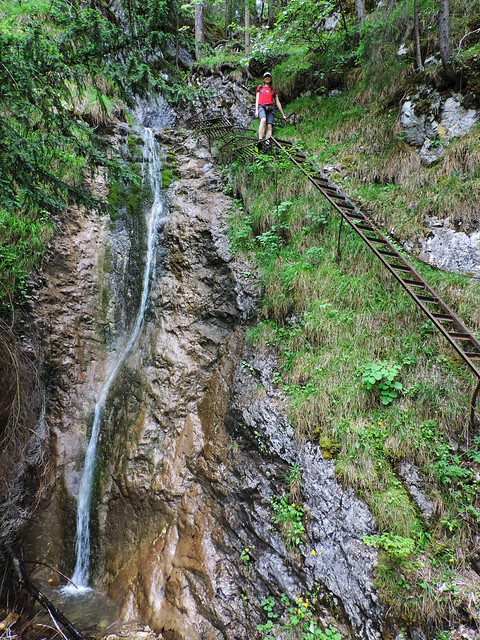 After hiking Kláštorská glen you can choose an easy way down to Podlesok from Kláštorisko fork. The high season for hiking is from late spring until autumn, but waterfalls are the most beautiful in late spring/early June after snowmelt. Be prepared with raincoats all the time even in summer – but summer showers are usually quick. We stayed in the small town of Hrabušice that’s in walking distance from Podlesok parking lot (maybe 15-20 minutes walk). The closest city is Poprad – it’s about 20 minutes from Podlesok by car. We usually book private rooms or apartments online – they are often the best deals for budget travellers. They usually have bathroom (shared or private) and a shared kitchen, too. What about you? Do you have a favorite glen hike?